The Standard EasyCreasePro offers superior channel-creasing capability across a broad range of paper stocks. Its convenient semi-automatic operation and desktop design create an ideal creasing solution for printed stocks that require a clean sharp fold. The exceptional quality and unique benefits of channel-creasing over traditional rotary scoring delivers clear performance advantages in preventing damage and cracking along a folded edge of paper stock. The Standard EasyCreasePro combines exceptional channelcreasing capability, remarkable productivity, and convenient semi-automatic operation in a compact desktop design. Ideally suited for creasing toner based digitally imaged stocks, the EasyCreasePro also excels with ink-printed images on a diverse range of paper stocks and laminations. The unique channel-creasing action of the EasyCreasePro virtually eliminates the common problem of cosmetic damage and imperfections caused by folding paper stock along an edge. Simple Operation: EasyCreasePro has a clearly marked indicator scale for accurate positioning of each crease. 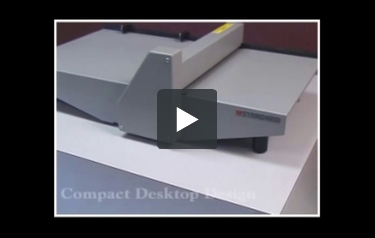 Speed-Stops quickly lock into position along the scale to assure that each crease is positioned accurately and consistently from one sheet to the next. Performing multiple creases is particularly simple and efficient with the Speed-Stop's unique rotary paper stop design. Additional speed and convenience is realized with electric foot pedal operation. High Quality Results: To help assure optimal results on virtually any paper stock the operator can select between either of two precision channel-creasing thickness modes. The changeover only takes seconds. The selector knob is simply rotated to select either the narrow or wide creasing head. In one even motion the EasyCreasePro applies a high quality crease across the sheet. The result helps to insure that the professional image quality of the sheet and its printed image is retained even after being folded. Minimum/Maximum Speed Stop Positions: 1.1"/17.18"
Weight/Shipping Wght: 49 lbs./ 52 lbs. The EasyCrease Pro is the machine to use when you need to fold documents that have already been printed. This machine does something that's known as channel creasing and it's perfect for a variety of stocks. Channel creasing your documents as opposed to simply scoring them results in a cleaner fold. Plus, your paper won't crack so your documents will look great. This machine can process sheets are up to 14.5 inches wide so you'll definitely be able to process letter- and legal-sized sheets. It's easy to crease 20 lb. bond paper with this device as well as cardstock and laminated items. The EasyCrease Pro works pretty quickly. It's able to crease a document in just 3 seconds so you'll be able to process a lot of paper in very little time. Using this device is almost as easy a folding a piece of paper by hand. The machine is equipped with an indicator scale so you'll be able to determine where to fold it for the best results. (Both standard and metric units are used.) You can lock this device's paper stops into place so you can do repeated folds and get great results with each sheet. Also, the EasyCrease Pro comes with a foot pedal to speed things up while also keeping your hands free. The EasyCrease Pro is actually pretty compact so it won't take up your entire workspace. Its dimensions are 29" (length) x 19" (width) x 8.5" (height) and it only weighs 49 pounds, so it's a good choice if you want to save some space. Like a lot of Standard's other products, the EasyCrease Pro comes with a one-year warranty. Wearables are excluded, however. The EasyCrease Pro can't perforate your documents. You'll need additional device to process your paper in this way. This machine doesn't offer continuous feeding so you may find that this slows down the process a little bit. However, the device's strengths should more than make up for this. Despite its couple of weaknesses, overall the Standard EasyCrease Pro is great machine and would be a terrific choice if you need a creaser for your important documents. This device works pretty quickly and it will give you great results every time you use it. You can process a variety of different papers with this machine as well as laminated items which is very convenient. Operating this machine is very easy so you'll be able to use it like a pro within very little time. Also, it's a good size and it won't take up very much room in your workspace. Overall, the EasyCrease Pro is another great product from Standard, so be sure to take a look at it today. Can I buy extra Paper stops for this creaser? Thank you for your question. We are able to order additional Speed Stops ( paper stops) directly from Standard as a part. Please reach out to our customer service department directly and we can get you a quote on cost and availability.